Matt joins the agency from The UMMA Center (Urban Muslim Minority Alliance) in Waukegan, where he has served as the Executive Director for the past five years. Prior to that, he spent 13 years at Pioneer. /PADS working his way up to the Executive Director position where he served for over 4 years. Matt has maintained strong connections with many service providers to the local homeless population. He holds a Master of Social Work degree from George Williams College of Aurora University, and is currently studying toward a PhD in Leadership Management from Capella University. A McHenry County native and resident, Matt’s existing network of local professional contacts will allow him to hit the ground running in his new role as the public face of HOS. 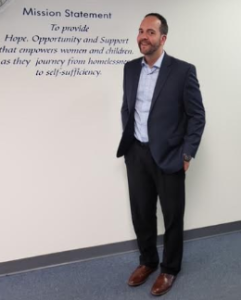 Board President, Joel Zarnstorff stated, “Matt is excited for the opportunity to bring the experience and talents that he’s developed throughout his career “back home” to serve at-risk populations in our community”. Matt stated, “ I am happy to be back in the Community and to serve those in need.” I look forward to meeting members from the community, volunteers, clients and constituents, my door is open”. Home of the Sparrow is a non-profit that provides Transitional Shelter, housing and case management to homeless women and children. The organization also operates seven Sparrow’s Nest Thrift Stores and Donation Centers and operates Community Threads Thrift Store located in Arlington Heights.